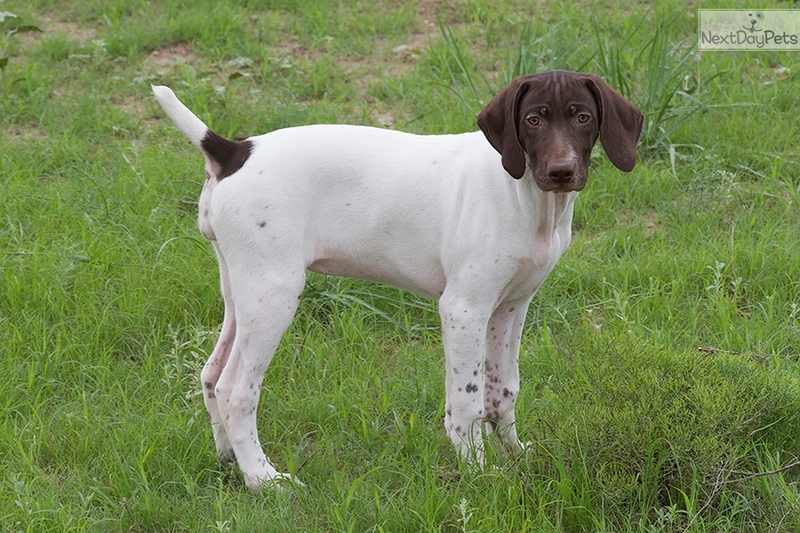 This German Shorthaired Pointer nicknamed Odette sold and went to a new family. PS Winchester - Odette was the first born out of a litter of 10, whelped May 6th, 2017. She is a big female German Shorthaired Pointer who is very intelligent pup. Her coloring is white and liver with one patch on her rump. Odette is a happy, spunky, very energetic puppy who loves to be outdoors, which will continue as she develops into a fine adult hunting dog. She enjoys retrieving small objects from her wading pool. Odette is being raised in a social family environment with much attention, love, and care. Her tail has been docked, dewclaws removed, and she is current with all shots and worming. Odette’s diet is carefully monitored to provide the proper protein and nutrition for a growing hunting puppy. The litter has been registered with the AKC. The Sire (PS WINCHESTER TOABBEN) is a very steady and consistent hunter that ranges short and methodical for hunting on foot. Toabben pointed and retrieved pheasants, in Nebraska, at the young age of 6 months. The Dam (VON WEIDER’S HNTR HEIDI) is also a superb and energetic hunter that was professionally trained and comes from a long line of hunting dogs. Heidi is an outstanding gentle and attentive mother. This was her second litter. Puppies from their first littler went to live and hunt in various states across the country from New York to the West Coast. One of the first litter females is now training to be a service dog to assist a veteran diagnosed with PTSD and a child with autism. For Additional information contact Doug or Lee Ann Miller at or (520) 307-5319.